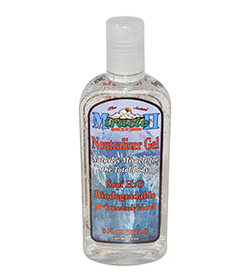 Miracle II Neutralizer Gel - 10 oz. Compare this gel with any other skin cream and you will be astounded. Accelerate healing and repair of skin tissue that has been damaged from wounds such as cuts, scrapes, bites, stings, poison ivy, and heat & sun burns. Ease aches & pains due to arthritis, over-work and varicose veins. Use it on your gums to stop bleeding. By supporting the healthy tissue balance, it can eliminate fever blisters, warts, moles, skin tags, stretch marks, and scars. Also wonderful as an aftershave lotion or tooth paste. Excellent for use in areas where concentrated effects are required for an extended period of time. It is a colorless & tasteless gel that dries quickly and is non-sticky. Often used in combination with Miracle II Liquid Soap. Electrically engineered eloptic energized stabilized oxygenated water, ash of dedecyl solution, calcium, potassium, magnesium and carbopol 940. Apply to the skin, as needed. Invaluable first-aid tool. Accelerate healing of damaged skin wounds such as cuts, scrapes, bites, stings, poison ivy, and heat & sun burns. Ease aches & pains due to arthritis, over-use, and varicose veins including hemorrhoids.